1. I'm a make-up artist. I have been doing make-up for quite some time. My first wedding I think was back in 2006? I went to cosmetology in California, but never pursued a career in beauty, for many personal reasons. I work for a Salon in town on a very part-time basis. I've been their on-call make-up artist since 2009 (not when I lived in Jersey though). We just collaborated and started offering make-up classes! I'm super excited for this! 2. My favorite Ice Cream Flavor is Pistachio. Yup, you read that right. I know a lot of people are surprised when they ask me. My other two favorites are Black cherry and Maple. I'm not your plain vanilla or chocolate type a gal. I usually like things that most do not. I like it that way. More ice cream for me! 3. My favorite place to be is in my bedroom in my bed. My bed is my safe haven and where I rejuvenate. The funny thing is that this bed is actually one Mary bought. It's a king size which means all the animals can fit on it if they want. In fact all three cats were laying with us the other day, I couldn't believe it! 4. My favorite animal is the sloth. The end. 5. My favorite food is rice. I grew up eating seaweed and rice and it has been a staple in my house. Growing up Asian you really appreciate it. Rice is one of those foods that has endless possibilities. So many recipes! I love everything from rice pudding to stir fried rice. I think my favorite type of dish that has rice in it would be sushi. I don't eat the raw fish but I enjoyed smoked salmon and tempura. 6. I drink decaf coffee on purpose. I'm not a fan of caffeine for many reasons. One of them is because caffeine has a tendency to throw me into a panic attack because I can't tell the difference between having a lot of energy or panicking sometimes. I just avoid it all together for my sanity and the people around me, but I love coffee! When I was a barista for that one minute of my life I couldn't stop drinking the stuff. Lattes are my favorite! 7. I hate my picture being taken. I know this sounds crazy but I do. 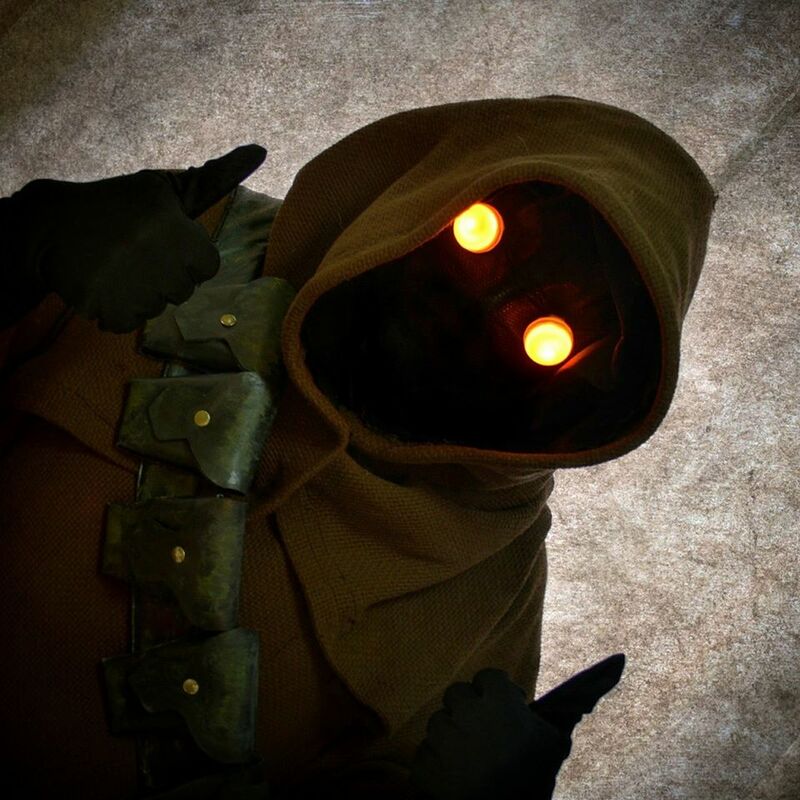 I know I take a lot of selfies, but if I This is also why one of the first costumes I chose for the 501st was a Jawa. I will most likely keep making costumes that cover my face. When we do a troop there are cameras everywhere. When I'm not in costume and I do see a camera coming my way I try to just give a big smile and hope for the best. I do want to be in pictures for the sake of memories. I just don't usually like them. I also struggle with outfit posts too, though I'm going to try to give them a whirl this year again. Out of the 80 pictures I usually take, there are only about 5-10 that make it to a blog post. 8. Instagram is my go-to app. I love Instagram so much! I've had my account for about 7 years now. In case you haven't seen mine here is the link to it: eekacupcake. I feel like it's twitter but with pictures. Since I love photography I guess it wouldn't surprise anyone that it's my favorite social media platform. I go on multiple times a day, even if I don't post anything. I love seeing people posts! Leave me your Instagram name in my comments and I'll follow you! 9. The first pet I ever had was a grasshopper. It was the cutest thing, at least to 4 yr old me. He lived in a box and I took care of him. I think I had him for a long time, but I'm not sure. At least a long time for a grasshopper. My grandma would freak out every time she saw it crawling all over me. I loved that grasshopper. 10. I am very spiritual. I'm Buddhist but I also have many other religions that influence my spirituality. Nature is my church, and love and compassion are my religion. I have crystals and I mediate and pray on a daily basis. I am also a Reiki Master and believe in energy healing. I'm also skilled in tarot cards and palmistry. I was taught (by some random gypsy, it's a long story) how to read palms over 20 years ago, and tarot cards came shortly after. I never share this with anyone, but there you have it! I hope everyone is having a great week! And if you do a 10 Things You Probably Don't know About Me post, link back to me in the comments!